coined by Leopold Kohr (1909 – 1994), an Austro-American philosopher and one of the least known great geniuses of the 20th century. What was to become the small-is-beautiful-movement in the 1980s is here up-dated in a spiritual perspective and may well set the tone or the era of Post-Globalization. Today’s life in a complex world of constant change is more in need of orientation than any generation before – but all of the last 300 years’ “great ideas” have failed to give lasting guidance. As the destructive consequences of modernization become more and more apparent, one might be tempted to equal the failure of the “great ideas” with the triumph of nihilism or the end of Enlightenment and its values. The author, however, is convinced that we are only entering a new phase of Enlightenment: The unfettered use of reason in its first phase brought us progress and endowed the individual with human rights – values nobody in his right senses would like to shed. A second phase of Enlightenment would have to enrich reason by increased understanding for context: holistic networking could thus add sustainability to progress; likewise, the re- discovery of religious and aesthetic wisdom would help to bridge the gulf between material and spiritual world. The book sketches first the spiritual and biological framework of man, finding there important political guidance: be it man’s longing for meaning, which he cannot find within himself; or be it the “wiring” of his brain, which needs “nearness” to work in a holistic way. In order to satisfy these innate traits and avoid catastrophes like a global information-overload, the author suggests an economy of the mind where the ideals of social nearness, sufficient time for free deliberation and cultural order should find a balance. 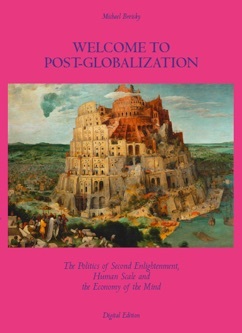 After discussing major political issues of our time the book concludes with optimism: Globalization will be mastered if we turn to spirituality; focus on cooperation between small regions and global NGOs (“Glocalization”); and continue to build on the system of open process and soft power developed by European Integration.